Bring your camera and ATV to the Coral Pink Sand Dunes, where 3,730 acres of sand and desert are open for exploring, with perfect terrain for that daring turn or unforgettable sunset picture. 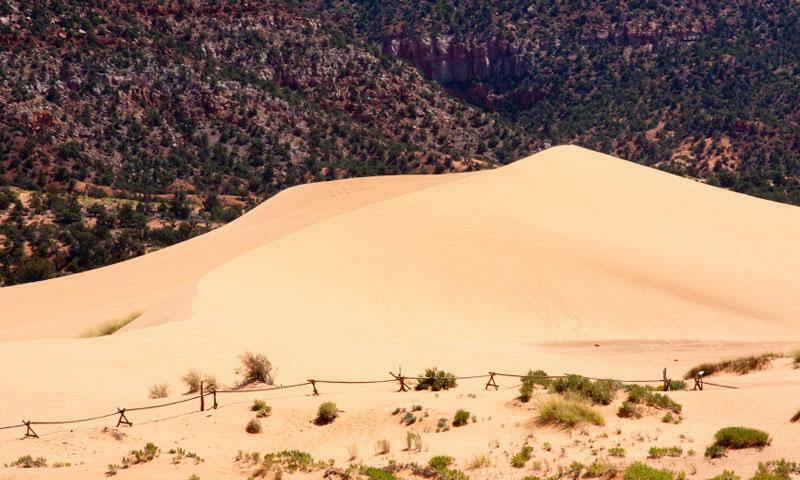 Home to 3,730 acres of sand dunes and desert terrain, Coral Pink Sand Dunes is a popular state park in southeastern Utah. 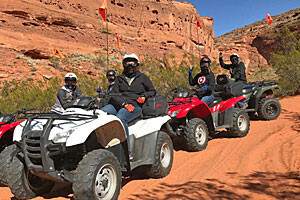 Off-Highway Vehicles, such as ATVs and dirt bikes, are popular ways to explore the area. Photographers have the chance to capture some unique light and landscape, particularly during sunsets. The only sand dunes on the Colorado Plateau are found in Coral Pink Sand Dunes State Park, Utah where the Moquith and Moccasin Mountains blow the sand from the Navajo sandstone found in the canyons and riverbeds of the area. It's no wonder that the dunes would be so vibrant, as they collect layers of color coming off the dark red, bright salmon and calm yellow of the sandstone. Coral Pink Sand Dunes is located in the southwestern part of the state, about 20 miles west of Kanab and 15 miles south of Mount Junction. The park is 11 miles south of US-89 on Sand Dunes Road. Single-day fees are $8, and the main campground is $20/night. This is the most common activity in the park, as the sand dunes provide excellent terrain to explore the 3,730 acres in an ATV, dirt bike or rhino. Following the trail is not required, making for an exciting day out in the sand. No photographer could complain about sunsets over sand dunes, reflections off the snow-fed ponds while salamanders quietly go about their routines. Just remember to bring plenty of film to capture the right shot. Bring some friends along with you for a night under the stars. Out in this remote area of Utah, there's very little light pollution, making the night sky even more brilliant. Amazingly, there are clear signs of ancient tribes passing through the area. On foot or on OHV, take some time to explore the Hell Dive Canyon Pictographs and South Fork Indian Canyon Pictographs. The Coral Pink Sand Dunes, Utah are thought to be 10,000 to 15,000 years old, time enough for the Coral Pink tiger beetle to find its way into the park, where it's now an endemic species.